Peanut Butter Nutella Fudge Cookie Cups are so soft and fluffy and filled with an outrageous Nutella fudge frosting! Can be made in a regular muffin tin or even in a mini! PIN IT TO YOUR COOKIE BOARD ON PINTEREST TO SAVE IT FOR LATER! Do you like to bake much throughout the year? Or only during the holidays? I am not a huge baker, and I only enjoy doing it during the holidays. Almost after single day after Thanksgiving, I am in the mood, especially for cookies, blondies, and brownies! I cannot get enough of them. 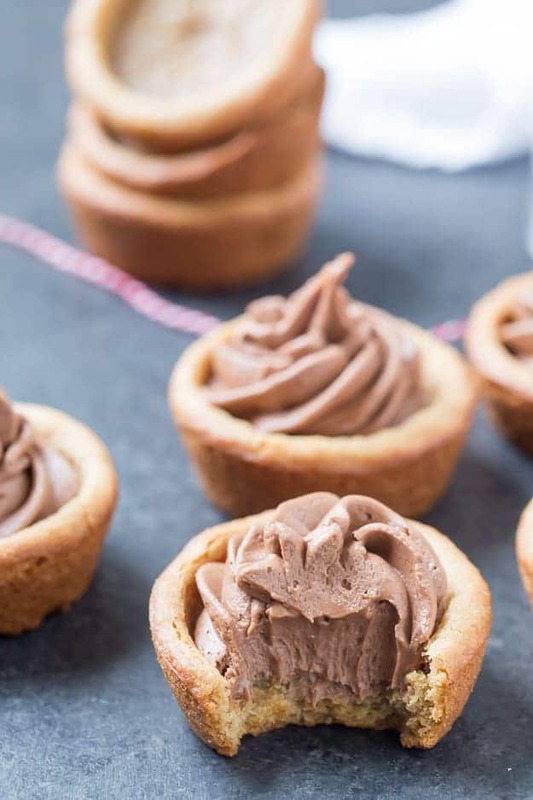 So this year I thought I would try to get into the baking mood a little earlier and share with you this incredibly easy and tasty peanut butter Nutella Fudge Cookie Cups. Once I sunk my tooth into one of these cookie cups, it instantly reminded me how much chocolate and peanut butter go together. It’s shocking I almost forgot! 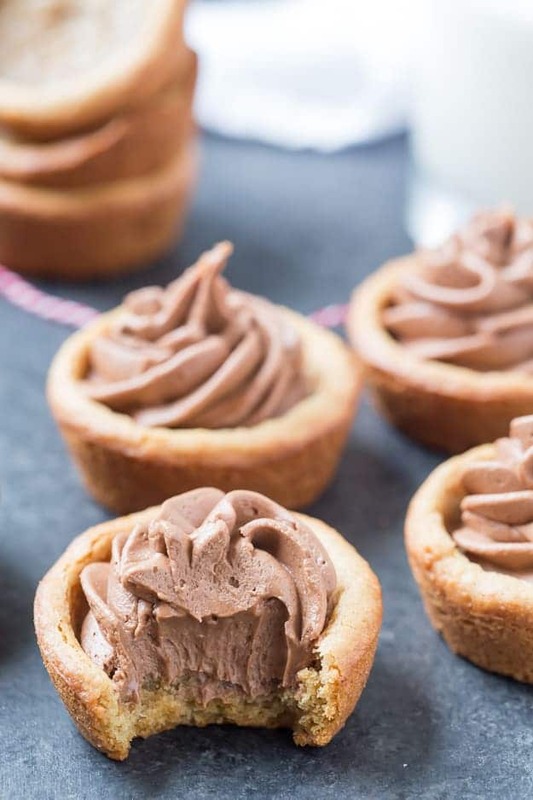 These cookie cups are baked to perfection, even a little underbaked because I love gooey cookie cup centers, and filled with the creamiest and silkiest Nutella fudge frosting. It’s a great way also to get the little ones in the kitchen helping you during the holidays. Baking during the holidays with family is always a cherished memory to have. 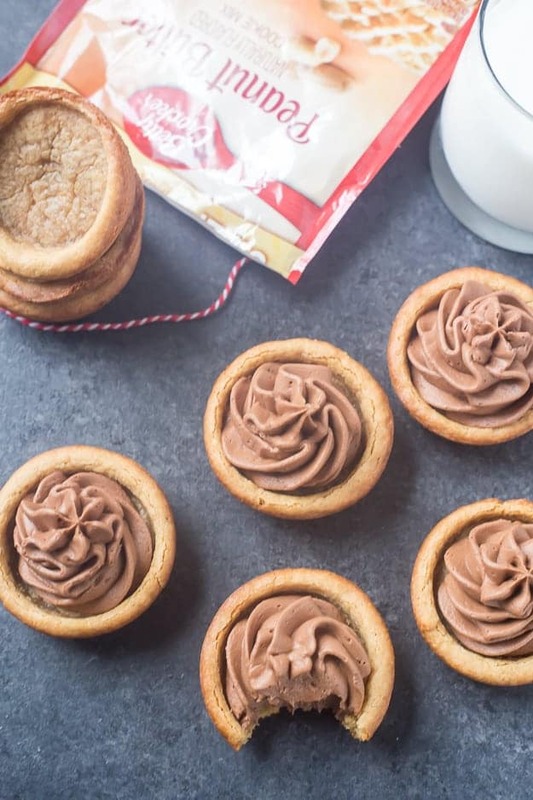 Even if you are the most experienced baker, I guarantee you these Peanut Butter Nutella Fudge Cookie Cups are so easy! You will not have any trouble with them, and I have a quick trick to make them even easier. My little trick in these cookie cups is the Betty Crocker cookie pouches from Walmart. They are a lifesaver and a stress-reducer during the holidays, especially if you are hosting a party or get together! The Nutella fudge frosting takes a few minutes to whip up and can even be prepared ahead of time. If you prepare it ahead of time, I highly recommend covering it tightly and placing it into the refrigerator. 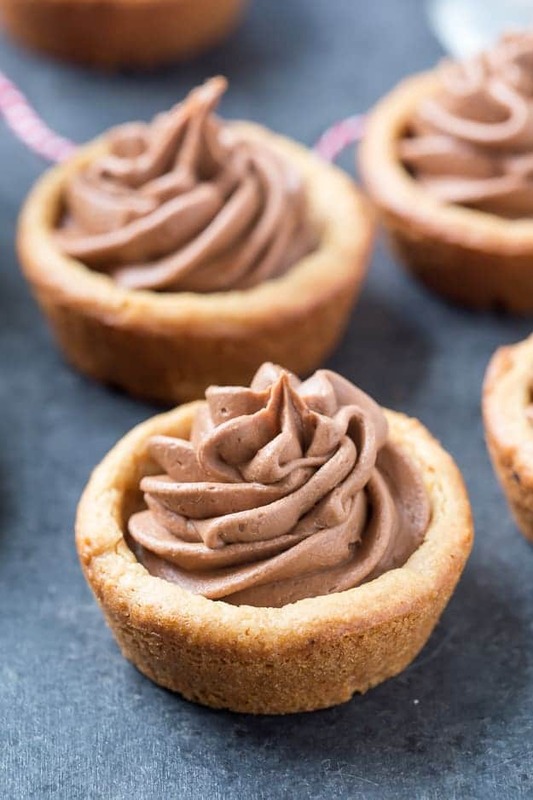 Once your cookie cups have finished baking, you can remove it from the refrigerator and pipe it into your cookie cups once they have cooled to room temperature. Place the cookie mix, egg, oil, and water into large mixing bowl and mix until combined. Take two tablespoons of cookie dough, roll them into balls, and press into the bottom and up the sides of the muffin tin until ⅔ of the way up, forming a bowl. Bake for 9-10 minutes or until the edges start to get lightly browned. Remove the cookie cups from the oven and allow the cookie cups to cool for 10 minutes before gently removing from the pan. Set aside. Prepare the Nutella fudge frosting by beating the butter until creamy and then beating the Nutella into the butter until combined. Add the vanilla extract and salt and beat until combined. Beat the confectioners' sugar into the mixture adding ¼ cup at a time until combined. Add the heavy cream in and beat until creamy. Using your thumb or a small glass bottom, press the center of the cookie cups down until it resembles a cup. Pipe the Nutella fudge frosting into the center and repeat until all cookie cups have been frosted. Place the cookie cups into a serving dish and serve or store in the refrigerator until ready to serve.